The HSGI Double Decker TACO® combines the modular pistol and rifle pouch into a single unit maximizing space while securing both your rifle and pistol magazine in a single pouch. The Double Decker retails all of the benefits of the original modular TACO® and the pistol versions accepting nearly all pistol and rifle magazine pouches. HSGI Double Decker TACO® pouches are constructed from Cordura and utilize injection molded polymer sides and are wrapped in shock cord which allows retention and expansion based on the type of magazine being inserted. The mag pouch will accept (1) Pistol and (1) Rifle magazine and is even compatible with smoke grenades, flash bangs, and some radios! Acommodates both single and double stack pistol magazines in addition to nearly all rifle caliber magazines including PMAGS, AK Mags, FAL, and M14 mags. The tension is quickly adjustable allowing you to customize the grip of your Double Decker TACO® mag pouch. Internally lined with soft Velcro, you can add double sided Velcro to your magazine for additional retention - or - add a shock cord pull top to the top of the pouch. Attaches to MOLLE webbing via (2) HSGI clips which are included with each Double Decker TACO® magazine pouch. I ordered these as the same time I ordered my Banshee plate-carrier. 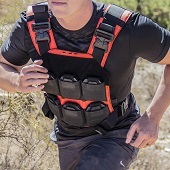 All I can say that, just like my review of the Banshee plate-carrier the product is top notch. The material and construction are superb. The pouches fit snuggly and are very secure. It keeps everything compact and accessible.